A line of moderate to heavy rain with a few embedded claps of thunder continues to push its way across the western parts of Central Alabama. 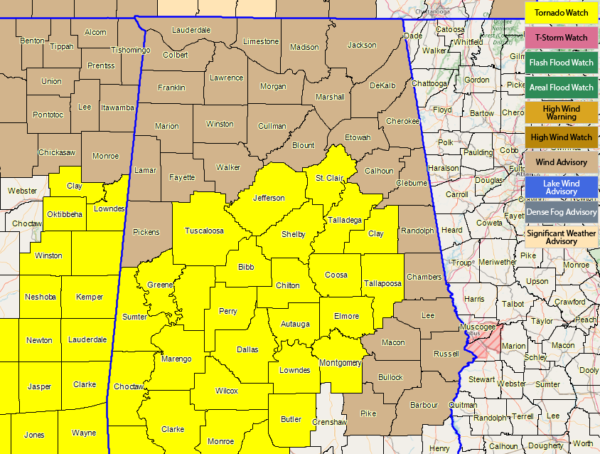 As of 11:20 AM, we currently do not have any active severe weather warnings in the area, which is a good relief considering we had a brief run of tornado warnings not that long ago. 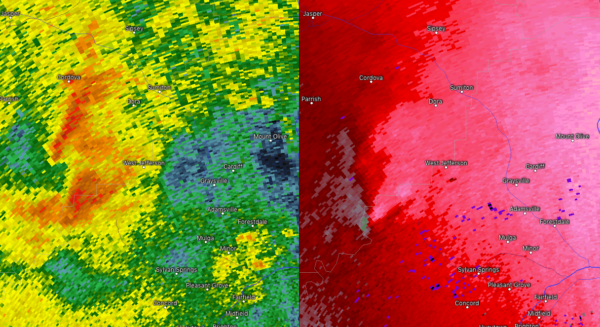 The good news is that there have not been any reports of damage in the areas that went under a tornado warning. 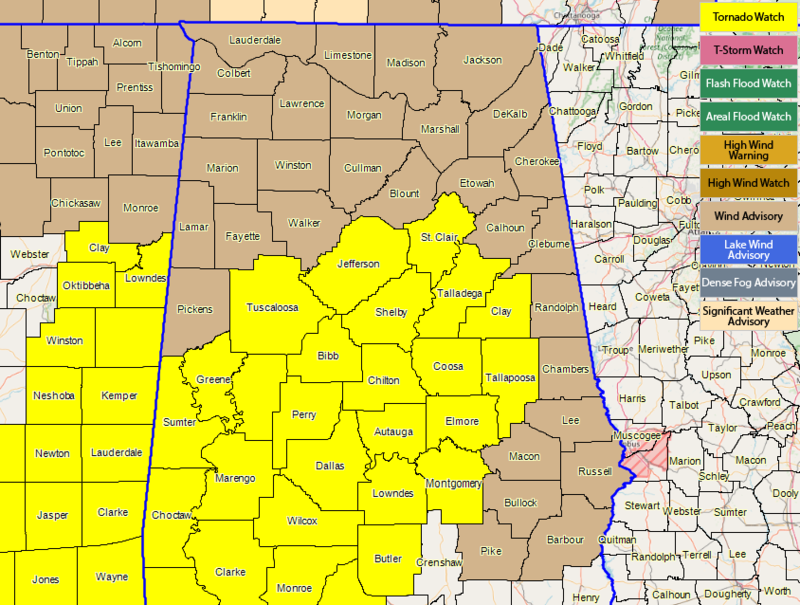 A Tornado Watch continues until 5:00 PM for much of Central Alabama, but NWS Birmingham is already looking into removing some of the western-most counties from the watch that the squall line has already passed through. We may have to watch a cell that looks to be redeveloping some rotation that is straddling the Walker/Jefferson border just to the southwest of West Jefferson and is moving rapidly to the northeast. Heads up if you are located in West Jefferson, Dora, Sumiton, and Graysville. The threat for stronger to severe storms continue to be mainly along and south of the I-59/20 corridor in the western half of the area and south of I-20 in the eastern half. Instability values are over 500 J/kg south of those corridors, along with the surface winds being backed out of the south-southeast. North of I-20, there is no instability and the shower activity is not as heavy. The line of storms is expected to be completely out of Central Alabama by 7-8 pm tonight and colder air will quickly rush in behind it with our daytime highs in the mid-60s to the lower 70s to quickly drop into the upper 20s to the mid-30s for overnight lows. We could still see some flurries on the backside of the front later tonight and during the first few hours of Sunday, but temperatures and breezy conditions will keep any accumulations from happening. Keep updated with us on the blog throughout the rest of the day.